The number of reported white powder scares rose dramatically after the September 18, 2001 anthrax attacks in the United States that killed five people. In the State of Massachusetts alone the local Fire Departments responded to an average of 400 mystery white powder calls that year (1). Recently, the number of reported white powder cases has dropped significantly with only occasional sharp increases when new cases appear in the media. In almost all instances the white powder material is a non-hazardous substance, usually mailed or left someplace as a hoax in an effort to threaten someone. The rapid and certain identification of the white powder allows local officials at the site to make important response decisions in a timely fashion regarding the public’s safety. After initial screening of unknown white powders for common biological and chemical hazards, polarized light microscopy (PLM) allows the First Responder to visually characterize and often positively identify an unknown white powder sample, making it one of their most powerful analytical tools. 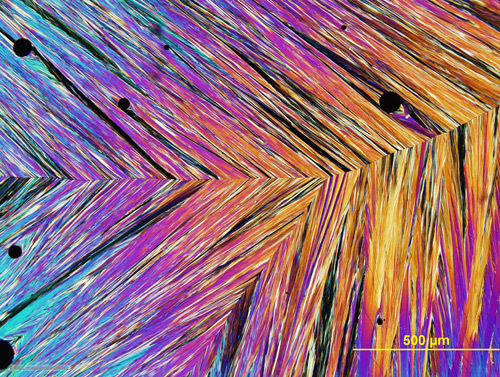 The polarized light microscope can rapidly reveal diagnostic characteristics of unknown white powders, such as homogeneity, consistency, size and shape, along with a variety of optical properties unique to a particular compound. These quick and reliable microscopical observations are important in helping to piece together data from other analytical instruments typically available to the First Responders, such as Fouier transform infrared spectroscopy (FTIR), gas chromatography, and mass spectrometry (GC/MS). The analysis of white powders using PLM becomes more limited under hazardous materials (Hazmat) conditions, largely due to safety precautions for the analyst. Before any white powder sample can be analyzed by PLM it must first be encapsulated or “locked-down” between a microscope slide and coverslip prior to its removal from a Class III biological safety cabinet (BSC). The sample can then be analyzed using PLM without exposing the First Responder to a potential hazard. Preparing the sample in this manner however, restricts other microscopic sample testing methods such as solubility, melting point determinations, microchemical tests, and refractive index measurements. The entire process of white powder sample collection, transportation, and eventual analysis by PLM involves a number of steps that are currently as varied as the First Responder teams doing the work. Even within groups of the same organization each Hazmat Team operates under a slightly different set of guidelines for white powder analysis using PLM. This paper proposes a protocol for the microscopical analysis of white powder unknowns developed by the McCrone Group in cooperation with the Cleveland Fire Department’s Hazardous Materials Response Team. The protocol utilizes standardized microscopy training in the use of polarized light microscope for materials identification, a new sample collection technique, and the introduction of a new micro-transportation device, all to be used in conjunction with a polarized light microscope housed in a Class III BSC. In a commencement address at the U.S. Naval Academy in May 1998, President Bill Clinton announced that the nation would do more to protect its citizens against the growing threat of chemical and biological terrorism (2). As part of this call to action 10 Rapid Assessment and Initial Detection (RAID) teams were established, each located near the 10 Federal Emergency Management Agencies (FEMA) sites throughout the country. The concept of the RAID teams was expanded and has evolved into today’s Weapons of Mass Destruction/Civil Support Teams (WMD/CST). Currently there are 55 WMD/CST throughout the United States including U.S. territories Guam, the U.S. Virgin Islands, and the Commonwealth of Puerto Rico. The mission of the WMD/CST is to support local and state authorities at domestic WMD incident sites by identifying possible chemical and biological agents and substances, assessing current and projected consequences, advising on response measures, and assisting with requests for additional military support (2). The WMD/CST consists of 22 trained National Guard personnel with each team member having a specific, and unique, expertise pertinent to the mission. Of the 22 members on the team it is the Nuclear Medical Science Officer (NMSO) who is responsible for a wide range of analytical equipment housed in their mobile analytical laboratory system (ALS). The NMSO must analyze, interpret, and finalize the results produced from each piece of analytical equipment within the ALS. With the exception of the polarized light microscope almost all of the analytical equipment in the ALS is considered to be “push-button” technology. Equipment that falls within this category usually includes: at least one portable GC/MS unit, FT-IR unit, and polymerase chain reaction (PCR) equipment. Each one of these analytical instruments produces a list of possible compounds, generated from a library of known standards contained within the software of the instrument. The polarized light microscope is the only major piece of analytical equipment in the ALS that is not considered push-button, relying solely on observation made by the analyst through the microscope. In the case of white powder analysis, it is the microscope that can provide visual results that helps to determine if a chemical or biological substance is present at the scene. Microscopical observations of shape, color, size, texture, of each particle is noted along with a variety of physical, chemical, and optical properties, making each component distinguishable from the other (3). Today, many local fire departments around the country are modeling their First Response programs after the nation’s WMD/CSTs. In fact, many community policies state that the local fire department be called first to investigate suspicious white powder cases rather than the WMD/CST (4). Fire departments have begun to purchase much of the same equipment available to the WMD/CST and are also developing their own mobile response laboratories. The Cleveland Fire Department is the first fire department in the country to use a polarized light microscope housed in a Class III BSC for the analysis of white powder unknowns, greatly enhancing the functionality of the polarized light microscope and adding an extra level of safety to the analysis. Because of the varied nature of any PLM analysis a step-by-step protocol is helpful to guide the analyst through various tests such as solubility, melting point determination, microchemical tests, refractive index measurements, and other important observations. The development of a protocol to operate and effectively use the glovebox microscope system is the focus of this paper. Using a Class III BSC to isolate a microscope was first described by James Siniski in 1968 (5). 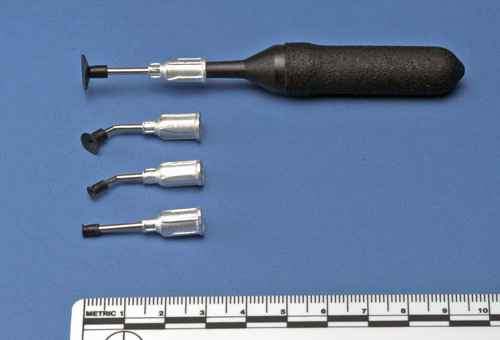 The work described in this report placed two microscope eyepieces inside two aluminum tube extension pieces, fixed to a window at 45 degrees, and parallel to the length of the body tube of a biological microscope. Sinski reported that the only problem with this design was that it did not have the ability to produce good clear photomicrographs because it lacked a camera port. This report also mentions that decontamination of the microscope performed by the “usual means”, with formalin and live stream, would most likely destroy many of the parts of the microscope. The photomicrographic shortcoming of Sinski’s system was remedied by Charles Boylen in 1971. Boylen describes in his report a modification of an infinity-corrected phase-contrast microscope that allows the attachment of a microscope camera system to be placed outside of the gastight glovebox (6). Boylen goes on to describe that by using infinity-corrected microscope optics, the distance between the microscope eyepieces and the objectives can be increased without an overall change in magnification. Therefore the distance required by inserting the glovebox barrier between the trinocular head of the microscope and the microscope body did not change the viewing magnification of the specimen. As a method of decontamination for this particular glovebox microscope Boylen recommends using ethylene oxide. Glovebox microscopy has also been used effectively to perform gravity-free experiments in outer space, where scientists have grown crystals of biologically significant proteins in microgravity environments (7). Such a system was installed on the International Space Station, and utilized an Olympus SZ40 zoom stereomicroscope attached to a video camera, all housed within an environmentally controlled glovebox. This system also allows scientists to keep all of the contents of an experiment such as liquids and fumes from floating out into the Space Station (8). Other non-hazmat related applications of glovebox microscopy include those where environmental conditions such as heating and cooling must be maintained in order to study the sample microscopically. Studies involving the structure of ice cream and the study of ice crystals in frozen foods have been done using a microscope housed in a thermally controlled glovebox. Many of these thermally controlled glovebox microscopy experiments employ the use of a polarized light microscope in order to study crystal formation (9-10). The McCrone glovebox microscope system is a self-contained unit designed for protection from biological and chemical hazards, and is a Class III Biological Safety Cabinet as defined by the Center for Disease Control and the National Institute of Health; it uses additional filters to provide chemical safety (11). The glovebox is divided into two chambers, separated by a single, sealed door. The first chamber is essentially an open space used to prepare samples and to carry out presumptive testing. The second chamber, containing the microscope, is accessed from the first via the sealed door. The microscope is an Olympus BX51 polarized light microscope with narrow-band 365 nm fluorescence capabilities. The microscope is also equipped with a Smiths Detection Fourier transform infrared (FT-IR) IllunimatIR® attachment for micro-FTIR analyses. 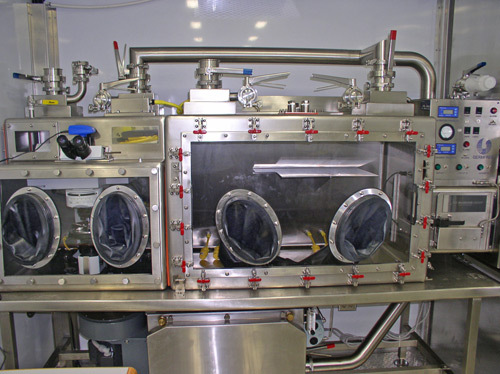 The entire glovebox can be decontaminated using vaporized hydrogen peroxide (VHP), and includes VHP inlet and return ports, shut off valves, sample and pressure control ports, and a circulating fan (Figure 1). In addition, the McCrone glovebox microscope system makes use of several accessories including, a specialized sample collection tool, a micro-transportation device, and a McCrone Hazmat thermal microscope stage. These accessories are key components to the entire McCrone glovebox microscopy protocol for white powder analysis. Prior to carrying out the PLM analysis of a suspicious white powder, sample collection, processing, and transportation procedures must first be in place. The sample collection procedures in this study have the added advantage of simultaneously processing the white powder sample during transportation in the field. This approach reduces sample processing times for the eventual PLM analysis, and minimizes sample handling within the glovebox. 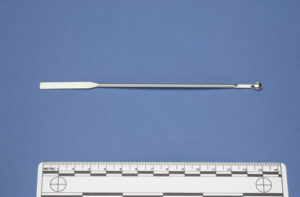 The white powder sample is collected using a 5 mm stainless steel spoon. The small spoon size helps to minimize the possibility of overloading the white powder sample carrier, a 16 mm quartz crucible (Figures 2-3). The quartz crucible acts as a substrate in which to view the white powder sample under the microscope. 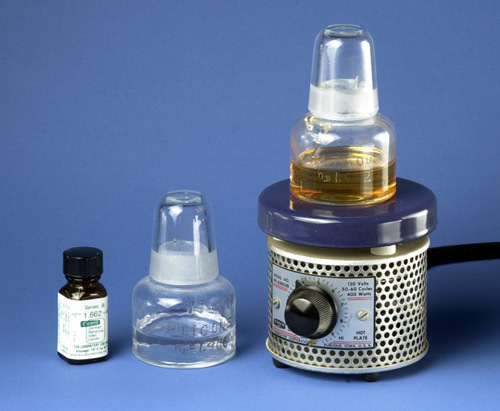 Overloading the quartz crucible reduces the amount of light that can be transmitted through the white powder sample, thus minimizing the effectiveness of the PLM analysis. Figure 2. 5 mm stainless steel spoon to minimize the possibility of overloading the white powder sample carrier: a 16 mm quartz crucible. Figure 3. The white powder sample carrier, a 16 mm quartz crucible. 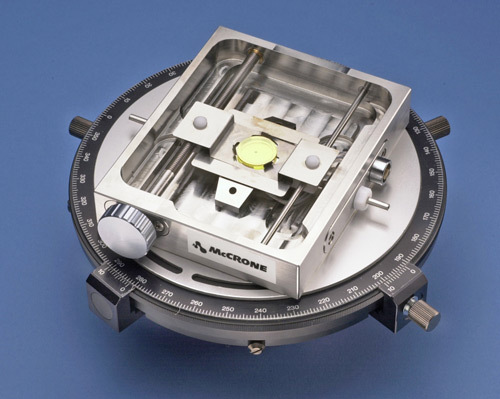 The quartz crucibles are housed in the McCrone micro-transportation device, an aluminum case that holds six 16 mm quartz crucibles with corresponding crucible holders, and 16 mm quartz windows (Figure 4). Figure 4. The McCrone micro-transportation device. 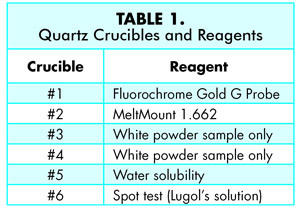 The quartz crucibles are numbered 1-6 in the transportation device and contain 1-2 drops of the following reagents; #1 ProLong ® Gold antifade molecular probe reagent, #2 contains MeltMount® 1.662, a thermal plastic resin with a known refractive index of 1.662, #3 and #4 contain only the white powder sample, for ATR infrared microscopy data collection and thermal microscopy analysis respectively, #5 contains deionized water, and #6 contains Lugol’s solution (13) (Table 1). 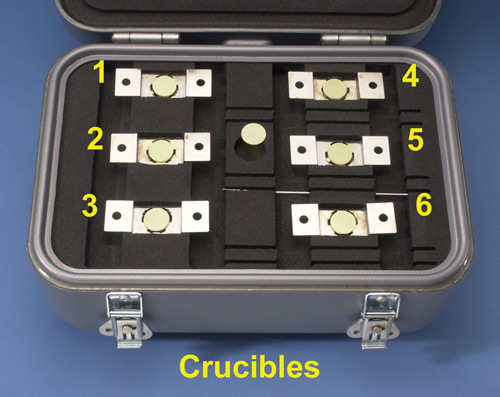 After loading the crucibles with white powder, the six quartz crucibles are sealed with 16 mm quartz windows using the McCrone vacuum tweezers (Figure 5). The vacuum tweezers create a vacuum between the rubber suction cup at the end of the wand and the quartz window, facilitating the manipulation of the quartz windows in the field while wearing protective gloves. Once the quartz crucibles have been sealed with the quartz windows, the micro-transportation device lid is closed, and the entire transportation device is decontaminated by submerging it in a 50% water/bleach solution. The transportation device is returned to chamber one of the glovebox in preparation for the PLM analysis of the questioned white powder sample. The crucibles are unloaded in chamber one of the glovebox, and a single crucible is placed into the Hazmat stage and analyzed (Figure 6). Figure 6 shows the PLM stage and the Hazmat stage removed from the microscope for illustration purposes. Figure 6. PLM stage and Hazmat stage (removed from the microscope). The initial microscopical observations are carried out at room temperature using crucible #1. After these initial observations, crucible #1 is removed from the Hazmat stage, and stage temperarture is increased to 80°C for observations using crucible #2.The increase in temperature allows the MeltMount®to soften and eventually become liquid. The temperature is increased further to a final temperature of 350°C using crucible #3. Described below are the microscopical observations carried out for crucibles #1-3 along with a reference table (Table 2). Crucible #1 contains the fluorochrome, Gold G molecular probe, for the detection of protein. The sample is viewed at 500X magnification using epi-fluorescence, 365 nm narrow-band ultraviolet cube. If the sample fluoresces under these conditions this indicates the presence of protein (Figure 7). Crucible #2 contains MeltMount® 1.662 and is used as a mounting medium for PLM. Observations made in this crucible include: isotropy versus anisotropy, and the refractive index of the sample relative to nD = 1.662. MeltMount® is typically used to prepare permanent microscopy specimens by heating a balsam jar of MeltMount® on a hotplate to approximately 80°C, and then using a glass applicator rod to transfer a drop of MeltMount® to a microscope slide. The specimen is introduced into the warm MeltMount® and then a coverslip is placed on top of the MeltMount® drop containing the specimen. The entire preparation is removed from the hotplate and allowed to cool. In this study it is the quartz crucible that holds the drop of MeltMount® rather than a microscope slide. Aside from the PLM observation made, the use of MeltMount® within crucible # 2 allows for observations of thermal reaction between the white powder sample and the MeltMount® at 80C. 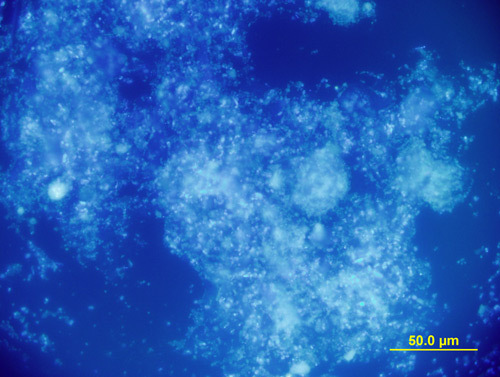 White powders of interest such as trinitrotoluene (TNT), ammonium nitrate, as well as several non-hazardous samples, melt in the thermally activated microscopy mounting medium and recrystallize when cooled, and serve as a diagnostic test for these substances (Figure 8 and Figure 9)(12). Figure 9. Fusion prep of trinitrotoluene. Crucible #3 contains only the white powder sample in which two analyses are carried out; micro-FTIR analysis using a diamond attenuated total reflection (ATR) objective, and the subsequent high temperature thermal microscopy for melting point determinations. In the interest of saving time, the Hazmat stage was not cooled, and remained at 80° during the analysis of the sample in Crucible #3. 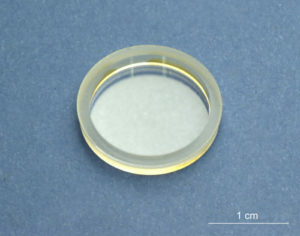 Using the diamond ATR objective at this temperature will not damage the adhesives holding the ATR lens element in place. However, at this temperature there is a risk of driving off low temperature volatile organic compounds. After the micro-FTIR data has been collected, the ATR objective is removed from the light path and replaced with the10X polarized light microscope objective. The temperature of the Hazmat stage is increased at 10°C/minute until the white powder sample is melted, or until the maximum temperature of the Hazmat stage of 350°C is reached. In this study the remaining quartz crucibles, # 4-6, were used to carry out presumptive reactions and observations primarily in chamber 1 of the glovebox. Crucible #4 similar to #3 contains only the white powder, and was used to analyze the white powder samples prior to the PLM analysis using a tabletop FTIR unit. This approach can also be used for individuals who do not currently own a micro-FTIR device and must rely solely on a tabletop FTIR unit. Crucible #5 contains deionized water to determine the water solubility of the white powder. Many times this observation can be carried out in chamber 1 of the glovebox using the unaided eye. Crucible #6 contains Lugol’s solution, which is used as a simple test for the presence of starch. This test can usually be performed with an unaided eye to determine if a positive reaction for starch has taken place. A positive test for starch using Lugol’s solution is indicated when the starch grains begin to turn a deep blue color (15). The McCrone White Powder Protocol and microscope glovebox system provides a safe environment for First Responders to carry out microscopic observations of suspicious white powders, and the platform to build upon and incorporate other white powder sampling protocols (16). Crucibles #1-3 are considered to be the foundation of the McCrone White Powder Protocol, while crucibles #4-6 can be used to vary the protocol depending on the needs of the First Responder. The entire glovebox microscopy system used in this study is considered to be a prototype and will be further tested with the Cleveland Fire Department over a 12 month period. Modifications and changes to the equipment and to the protocol will be reported on after the 12 month evaluation period is completed. The author would like to thank Lt. Terry Bindernagel of the Cleveland Fire Department for his participation and input to this project. Global Security.org © 2000-2005, (Date accessed: December 1, 2005). Laughlin, G.J. “Counterterrorism and the Polarized Light Microscope”, American Laboratory, April, 2003, p. 10-13. Sinski, J.T. “NOTES: Use of the Microscope in a Gastight Safety Cabinet System”, Applied Microbiology, Volume 16, No. 5, April 1968, p. 659-660. No. 6, June 1971, p. 1089-1090. Hannaford, B., Hewitt, J. Maneewarn, T., Venema, S., Appleby, M. Ehresman, R. “Telerobotic Macros for Remote Handling of Protein Crystals”, Proceedings of the International Conference on Advanced Robotics, Monterey, CA, July 1997. NASA Space Operations Mission Directorate, October 17, 2002, www.nasaexplores.com, accessed 12-07-2005. Hartel, R.W. Crystallization in Foods, Edition 1, Springer, 2001. Science, 1991, Vol. 74, p. 3334-3344. “Biosafety in Microbiological and Biomedical Laboratories”, U.S. Department of Health and Human Services, Centers for Disease Control and Prevention, and National Institute of Health, Fourth edition, April, 1999. Delly, J.G. “Mounting Media for Particle Identification”, The Particle Analyst, Volume 1, Number 8, April 20, 1968. Wallis, T.E. (1957). Analytical Microscopy; Its aims and methods in relation to Foods, Water, Spices and Drugs. Second Edition. J & A. Churchill, Ltd., London. Third Edition (1965), Little, Brown and Company, Boston. Cooke, P.M. Microscopical Identification of White-Powder Unknowns (Part 1), College of Microscopy course curriculum development, 2004. Atlas of Microscopic Particles, www.mccroneatlas.com. ASTM Designation: E 2458-06 “Standard Practices for Bulk Sample Collection and Swab Sample Collection of Visible Powders Suspected of Being Biological Agents From Nonporous Surfaces”.